This post is an introduction to the new JSON support for SQL Server 2016. The post is an entry level post, suitable for someone who is using JSON methods for the first time but who does have some knowledge of T-SQL and a basic understanding of what JSON is. JSON support has been introduced into SQL Server for the first time in SQL Server 2016. It was a highly requested feature on Microsoft Connect. Since there are new methods added to SQL Server, I wanted to test them out and get to understand them. This code will only work in SQL Server 2016 so you need to have an instance of 2016 available to use for the demo. You can also use Azure SQL Database. See announcement. Database compatibility level 130 is required for OPENJSON function. Other functions are available in all levels. Note that you need to have new V12 server. Use an existing database or create a new one. I created one called Learning. 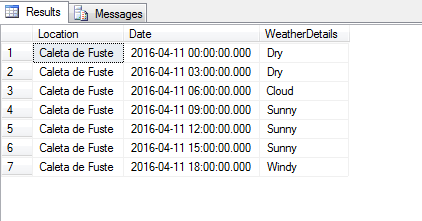 Then create a table to use for the demo called Weather. DROP TABLE IF EXISTS Weather; -- This syntax is new too. Now that we have a table and some valid JSON, we want to insert the JSON text into the table we just created. Replace the values for Location and WeatherDetail in the code below with your own values with your own or simply just run the code I have provided below. The ISJSON built-in function is used to verify that your JSON text is properly formatted. The queries below select the values for Location and WeatherDetail from dbo.Weather and also the return value of the ISJSON function against these values. 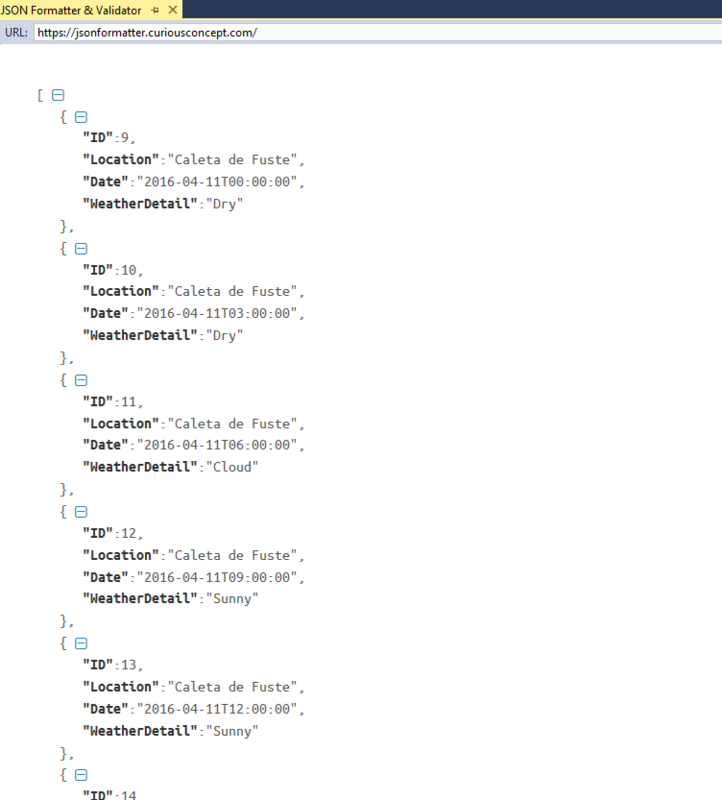 We can see that the value of Location is Paisley and that this is not a valid JSON value. We also see the value of WeatherDetail and that this IS a valid JSON value. Let’s insert another JSON value with fewer details into dbo.Weather. This will help us when we try to query it later. Let’s just check what we have in the table (and it’s validity) before we move on. Nice. Both fields contain valid JSON. -- As you will see, this query displays the JSON data as an easy to read table. Let’s now create a new table and insert some data so we can understand how to use FOR JSON. -- This select gives us our data in the familiar table format. Limitation: SSMS still uses the XML editor to show JSON so it doesn’t display it correctly when you click on it. This is much nicer when we paste the output into https://jsonformatter.curiousconcept.com/. This blog post is quite large and still only covers a small part of JSON support for SQL Server 2016. There are more built in functions such as JSON_VALUE, JSON_QUERY, & JSON_MODIFY which I hope to cover soon. Event Description: SQL Server failed with error code 0xc0000000 to spawn a thread to process a new login or connection. Check the SQL Server error log and the Windows event logs for information about possible related problems. This SQL Server hosts the databases for a few utility apps and has always ticked along without any concerns. However, more and more databases had been added over time and most recently Altiris was added and this is when the problems began. Searching online, I came across this question and answer in which Jonathan Kehayias suggested the problem could be caused by threadpool starvation. It doesn’t seem to be a common problem so I had to look into to it to find out more. In his first answer, Jonathan suggested that scaling out or splitting the workload across more SQL servers would work better than scaling up because the max number of worker threads increase would not be sufficient by scaling up. I looked into the server but realised it was had a very low spec of only 2 CPUS and 4GB memory to support 20 databases of varying sizes so in this case, maybe scaling up would help. Had I read on, I would have seen that Jonathan didn’t expect the guy’s server to have such low spec (1041 databases 1CPU 2GB RAM) and he also advised scaling up. Querying the DMV sys.dm_os_wait_stats returns a count of waiting tasks since the last restart. I ran the query below and found that this system had experienced 18,000 threadpool waits per day since its last restart. 300,000 in total. As the stats are cumulative, I wanted to know how often the threadpool waits were happening right now. I set up a sql agent job to collect the waiting_tasks_count from sys.dm_os_wait_stats along with the date of collection and scheduled this to run every minute. I found that I was receiving threadpool waits at a rate of 822 per hour, roughly 14 per minute. Fortunately for me, this box was a virtual machine (VM) and as such, adding CPU and memory was a fairly seamless process. I doubled the CPUs and increased memory to 16GB to give SQL Server a fighting chance. I could go further if needed. Once this was added, I continued to monitor the count of threadpool waits every minute and found they had reduced from 822 per hour to <1 per hour. To summarise, although I’m sure it’s not always the answer, I found that beefing up a very low spec server had a dramatic improvement on threadpool waits. I should add this was a 64bit SQL Server running 2008 R2. Whilst deciding what to do and getting more information on threadpool starvation, I read a number of other resources which are listed below. As always, your comments and suggestions for improvement are welcome.